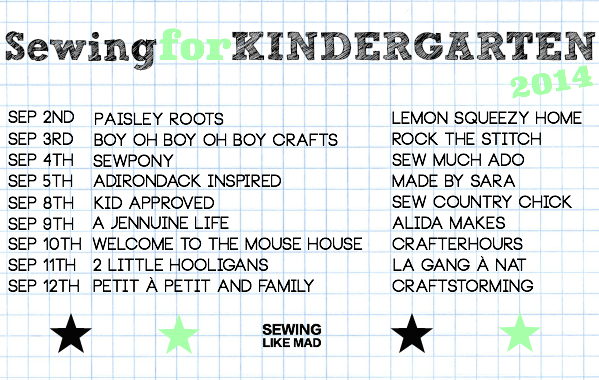 Today we're kicking off Sewing Like Mad's Sewing for Kindergarten series! I have a giveaway too, so make sure you read to the end! Zoe is my Kindergartner this year and she is just thrilled! She's gone to Preschool for the last 2.5 years (she has speech) so she was beyond ready to start. She is pure energy and school is so good for her! I don't remember my first day of Kindergarten, but I do remember Kindergarten. I had a little boyfriend named Michael and he was the sweetest kid ever. He would ask me what I wanted to do during recess and if that meant I wanted to swing, he would push me. If I wanted to paint, he would get the paper on the easel ready and the paints and paintbrushes out. The hoodie is the Coastal Pullover from Amelie & Henri. I made it out of this slouchy knit that I've had forever. 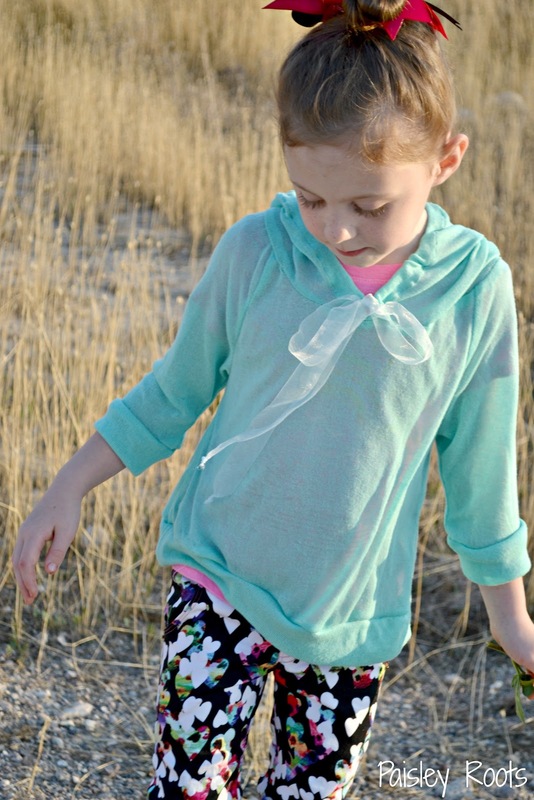 It matches the teal in the pants perfectly and hoodies are a must going into the fall! And lastly are her kicks. 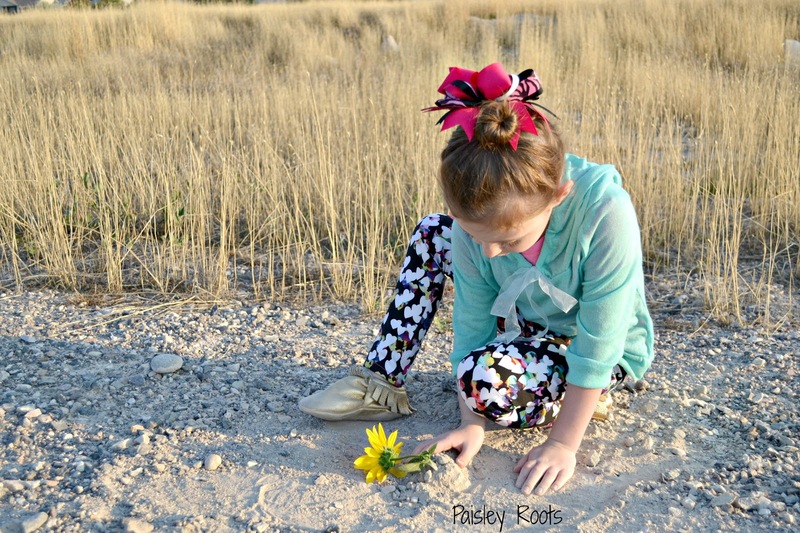 We got the Stone Suede Moccs from Freshly Picked and loved them so much I wrote to them asking if I could have a giveaway! They were so amazingly sweet and not only said yes, but they also sent us out another pair to review as well! I let Zoe pick the second pair and she picked the Gold ones. 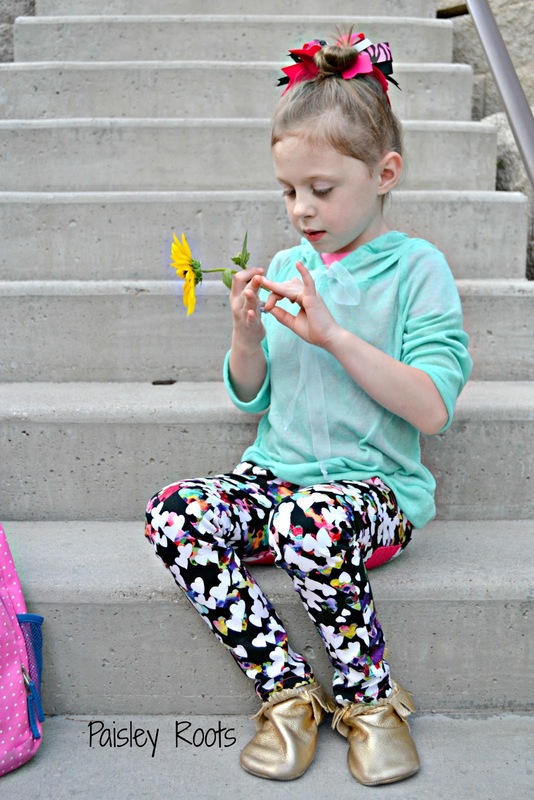 She loves them and hasn't worn any other pairs of shoes to school. The Gold is made of thinner leather and are very light. You can see that her little footprints are starting to show on the bottom. Zoe has told me how comfy they are and with the weather changing they have been perfect! They keep her little feet warm, but are breathable enough that she has not complained about her feet being too hot when it gets warm outside. The gold has also been the perfect color for her wardrobe! The stone suede ones are of thicker leather and will be perfect when it gets colder. I love the neutral color of these and they go great with everything. 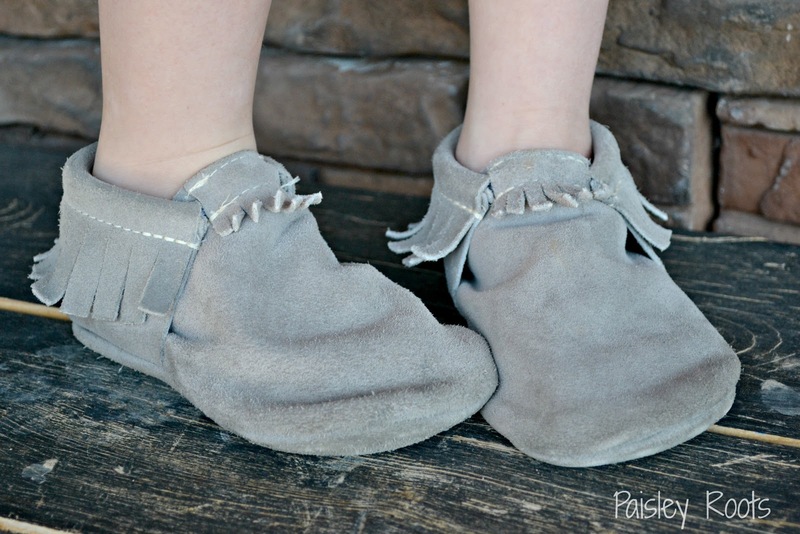 Something to note is that these are true moccasins and are soft soled, which is really perfect for us cause Zoe loves to go around barefoot and these give her that feeling but also provides protection. So it's a total win! So, a few things before you enter the giveaway. 1- Shipping to U.S. residents is paid for. 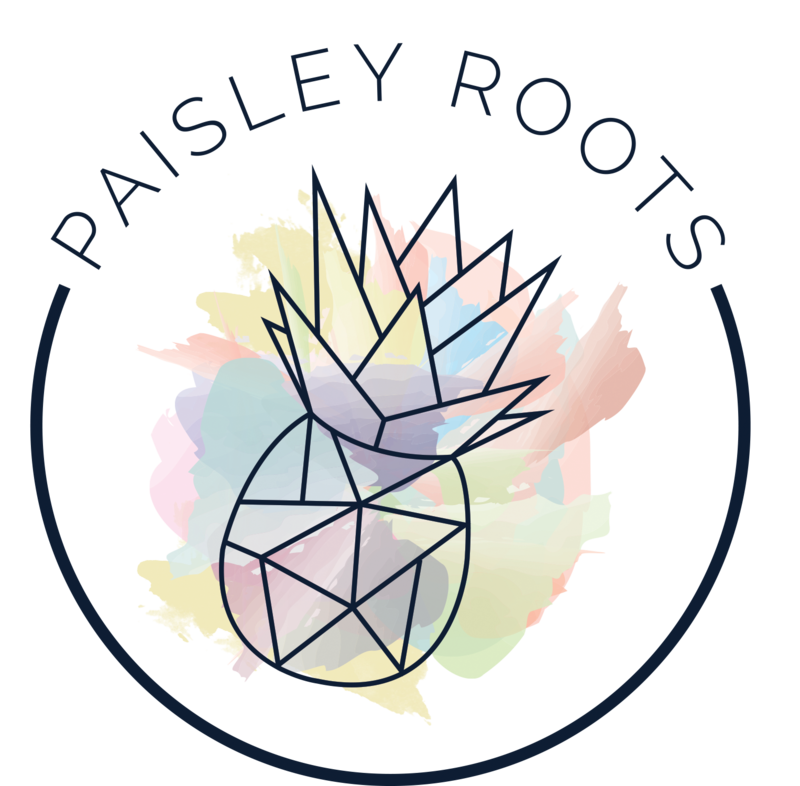 Any international winner will be responsible for shipping costs (which is still an amazing deal!) so everyone enter!! 2- Winner may choose any size and color that is available in the shop. 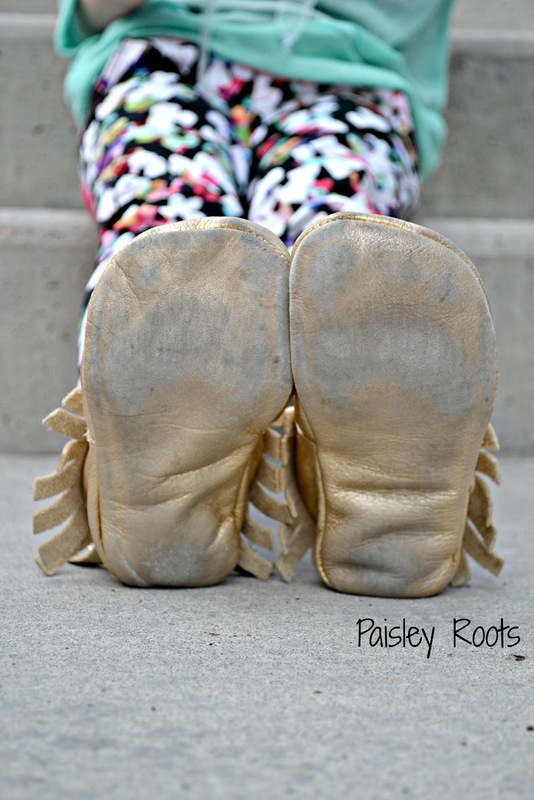 3- The winner can not have won any other giveaway including a pair of Freshly Picked moccasins within the last 60 days. 4- Giveaway runs from Sept. 2 to Sept 8 (11:59pm). So now enter! 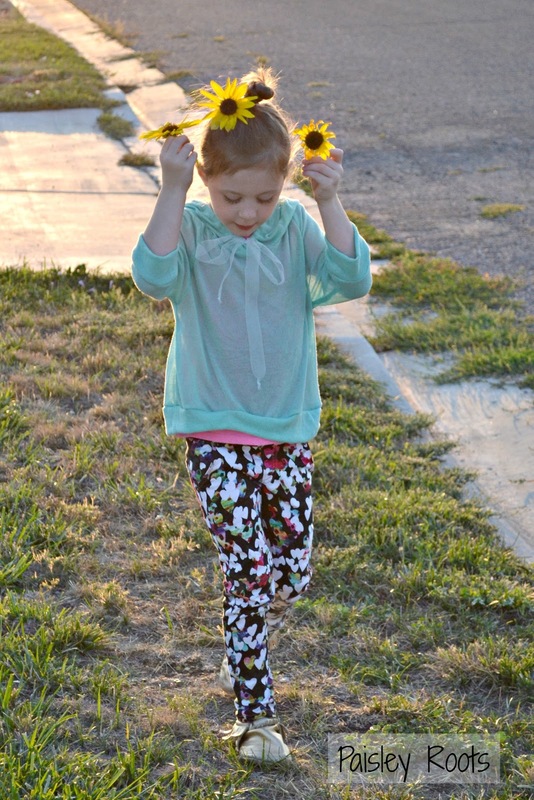 Then head over to Lemon Squeezy Home to see her amazing Kindergarten outfit! 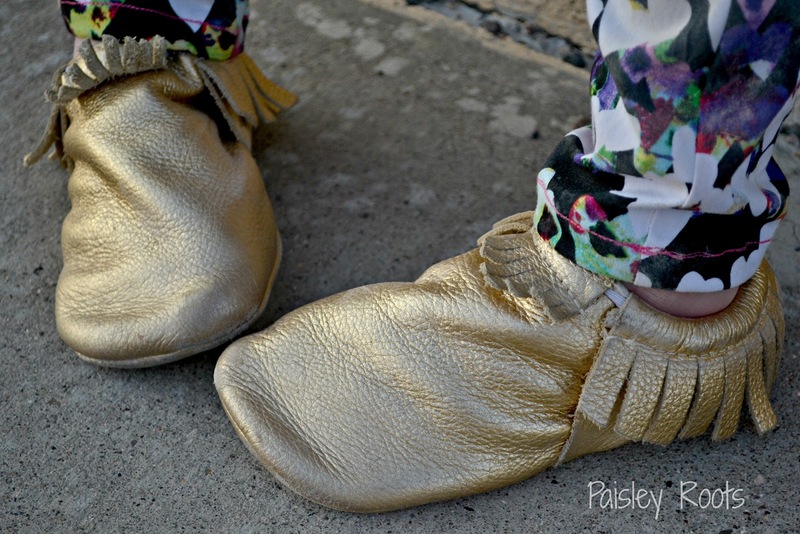 I will come back later and enter that giveaway - how cute are those gold slippers! Soooo cute!! Love Love Love those Cargos. That print is so fun! She looks adorable! I want a pair of those jeans in my size too! Gosh, she's got to be the coolest kid in school. Love that fabric and the flow-y nature of the top. Beautiful! Love Love Love all the look! It's so cute!!! I love the golden ones but my daughter love the watermelon ones. Those pants are simply perfect! I love this pattern, and think it may be one I need to get soon. 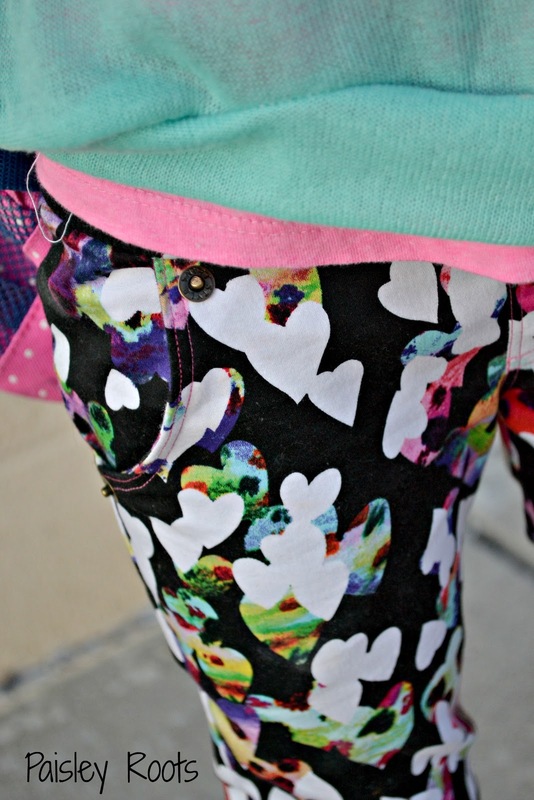 And that fabric.. ah-mazing! Another gorgeous outfit! I would totally choose Swimming with the Sharks! I love this entire look. Kudzus are the BEST! these are fun shoes, but as always, what a fun outfit!!! Awesome, fun outfit! 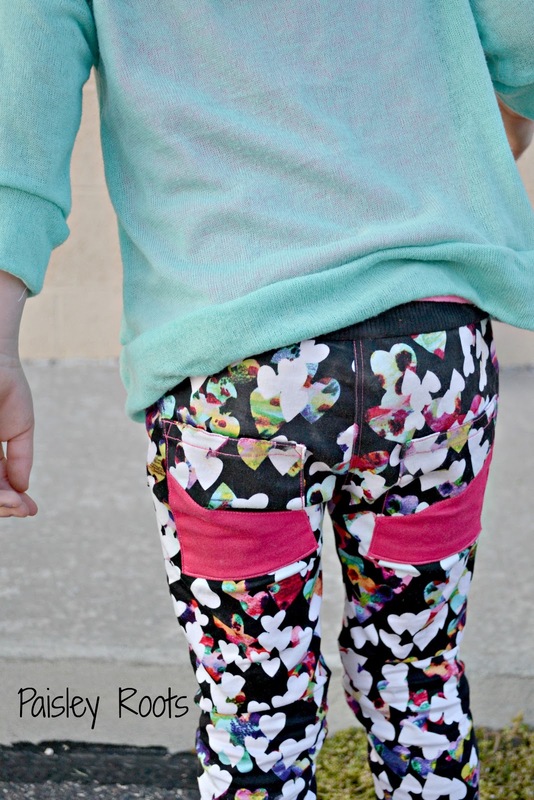 Looks like something my daughter would wear, but sadly, she has to wear standard school attire to her kindergarten. I love the mocs, but I don't think they make them large enough for my kid! She'd love the gold, red, or yellow ones though. I'd choose the glacier moccs! Weathered Brown! My boy would rock 'em! I want the watermelon shoes! Go big or go home! That hoodie is to die for, I seriously want to make one for myself! Awesome outfit- head to toe! My favourite mocs are the picnic ones. I want this outfit for me too! I'd choose the weathered brown. I'd go with neon pink. Super cool and funky outfit! I wish Gigi could wear fun stuff like that to school sometimes! She wears a uniform. 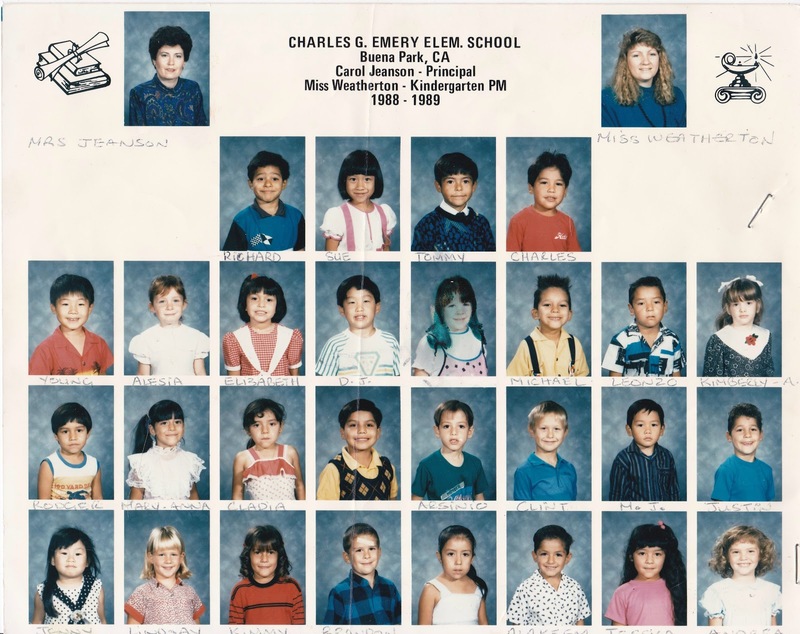 And I lived the school photo. You must have gone to Knotts Berry Farm! That school pic is killing me. So funny that she drew on it. Ah sisters haha. I love how delicate the hoody looks in contrast to the pants. This is a perfect outfit. And wow I would love to get my hands on a pair of those mocs! I would love the frosted rose. Love the outfit! I would love to have the BORN IN THE USA - LIMITED EDITION MOCCASINS for my grandbaby. Your outfit is so cute! Loving the jeans especially. I've been eyeing that fabric for a while now:). Great job!! Yellow! Thank you for the giveaway! Carly, your clothes always look so comfy and stylish and this one is no exception! I loved your kindergarten picture and the story "attached"! I wish I could sew. And your kids are sooo super cute and I love the gold!!! love the gold, your daughter has good taste! 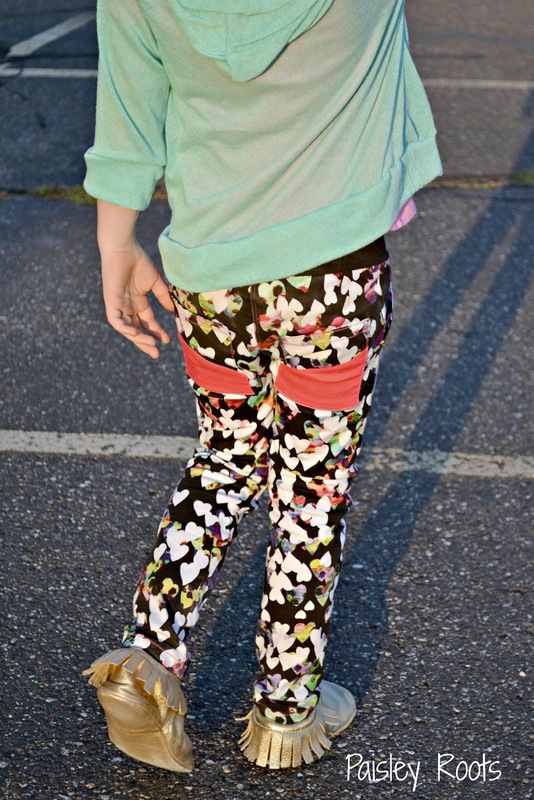 Love the pants and those shoes are adorable!! So cute, Karly! She looks so much like you. My daughter would go crazy for that denim :) I love it. We've been looking at these shoes for a while now, very cute. would love to get the glacier or stone suede ones. I love the hoodie in the gauze! The whole outfit is adorable! 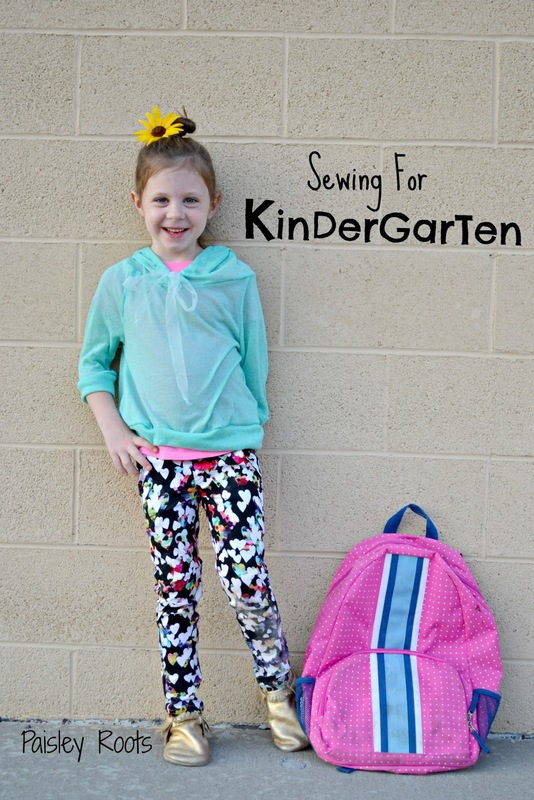 I need to start sewing for some kindergarten fun!!! I love all of the colors but I think I would choose Rose Gold. I love all the colors but I'd probably choose the Sprout or Prince George. I would choose the sand suede! just love all of it! I want this in my size too! 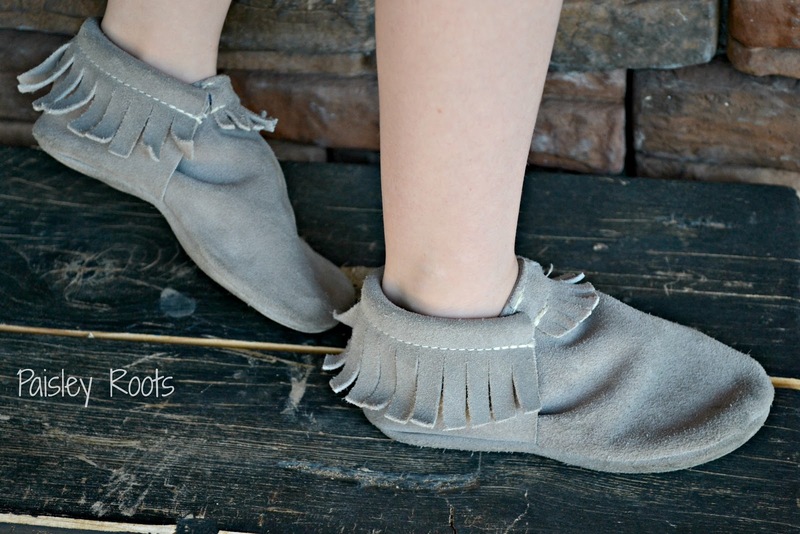 LOVE those mocs! I would love a weathered brown pair for my son. Or grey, I don't know!! Cute outfit!! I would pick the ebony ones. I definitely would pick the watermelon!!! 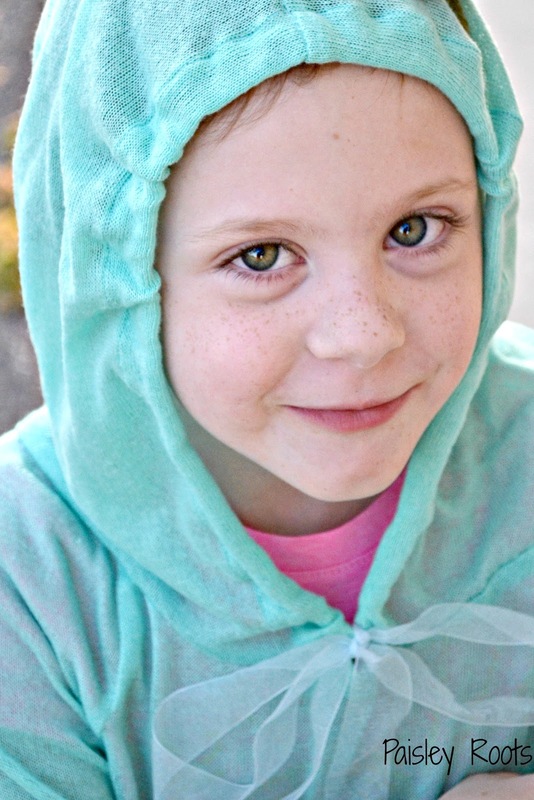 I just love that teal hoodie! I would get theWeathered Brown colored ones. 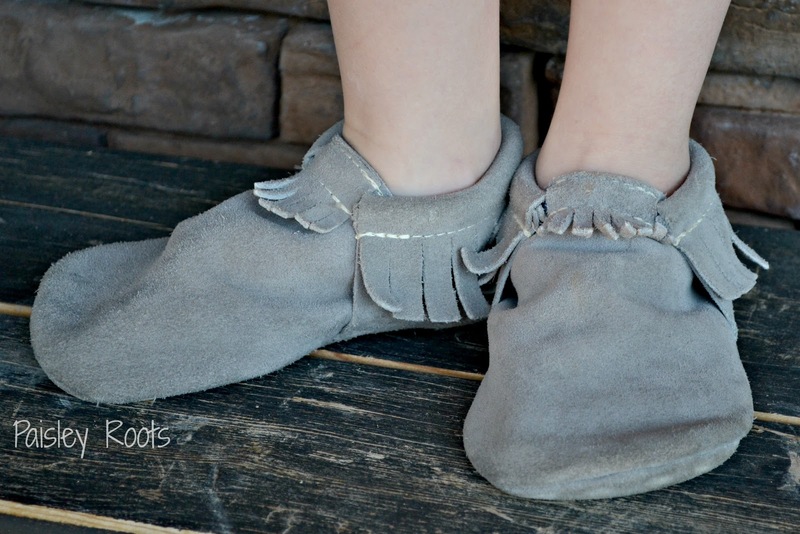 I like the stone suede mocs!! Throughout all the choices, the one I would choose is "BORN IN THE USA"! I seriously love these and they would be that gift that others would be talking about at the baby shower! So it only seemed right to enter the contest - I love that you have developed some amazing things - I plan to share this site with friends & family! I will always recall that of viewing such an amazing item - how cute are those flag shoes! I heart the Camo Moccasins! I would pick the camo ones. They're adorable! I would choose the Stone Suede. My daughter is in Kindergarten this year and would love them! I would pick the walnut ones. They are so cute! I would choose the Sprout Limited Edition!